Micky Taylor (second from right) was thrilled to see his side win in their FA Cup tie. 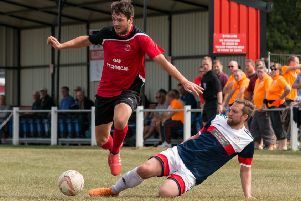 Three second half goals in 20 minutes saw Clipstone come from 3-0 down to win an enthralling FA Cup tie 4-3 at Barton Town on Tuesday night. The Cobras looked to be heading out when Donald Chimalilo gave the home side a 3-0 advantage in the 36th minute, adding to earlier goals from Will Waudby and Gareth Barlow. However, a superb Tim Gregory header from a Julian Topliss cross just before half time ensured the visitors went in at half time with a little hope. The game turned just after the hour mark. A smart turn and shot by Topliss went just wide of the post and when Barton ‘keeper Nathan Popple took a short goal kick a defensive mix up presented Mark Carter with a chance to fire the ball into the unguarded goal. The Cobras were back on level terms in the 76th minute when another defensive mix up involving Popple presented Carter with his second goal of the evening. It got even better in the 82nd minute when a Topliss free-kick was headed home by substitute James Munson who had only been on the pitch for four minutes. And it all left Cobras boss Micky Taylor thrilled after the game. He said: "It was unbelievable. At 3-0 down I feared we were in for a drubbing but then Tim scored I just sensed there was a belief about the lads, and at half-time I said to them that we needed the next goal. "We got it and I looked at Barton and their legs looked dead, they were gone, and when we got the third I just had a feeling we'd get the fourth. "It's fantastic and I'm so chuffed for everybody at the club given the hard work everybody puts in. "We showed such strength of character. Mark Carter was the best player on the pitch by a country mile - he didn't put a foot wrong and his positional sense was fantastic and he got two goals as well." Attention now turns to a local derby with Teversal in the league at the weekend, with Taylor adding: "It's one we've all been looking forward to given the connections between the clubs. They've had a good start to the season whereas ours has been up and down, but hopefully this can propel us now and we can start getting wins in the league." Clipstone will now travel to Anstey Nomads on Saturday 25th August as they look to progress further in the FA Cup.